I was at the vet getting a button quail treated. Dr. Levoy walked in and told me he had a lady in the lobby looking to get rid of a conure. After my appointment was over I found her in the lobby. She was a younger woman, late twenties or early thirties, and was carrying a newborn baby. She explained that she had a mitred conure she was trying to find a home for. It had been in her care for six years. The fact that she’d just had a baby and her husband hated the bird’s noise had forced her to get rid of it. Right now the bird was staying at her parent’s house. Apparently the bird took many such "vacations" to appease the husband. I gave her my phone number and she said she’d call as soon as the bird was back at her house. After a few weeks and no call, I virtually forgot about the incident. 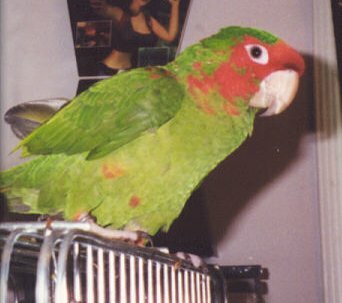 About six weeks after the chance meeting, I got a message on my answering machine regarding the conure. Was I still interested and if so would I call back and arrange a time to see it? I called her back and agreed to come view the bird. His owner actually knew quite a bit more than most do. She knew she had a mitred conure. She’d read up on the proper diet but had been unable to convert him. The bird had become so picky that it would eat nothing but safflower seed, white bread and apples (no rind). She said he liked to hang out on the T stand by the mirror but would also climb down the cage and wander around the floor. Among her reasons for getting rid of him was her fear that he would hurt the new baby. He also wouldn’t be receiving as much attention. 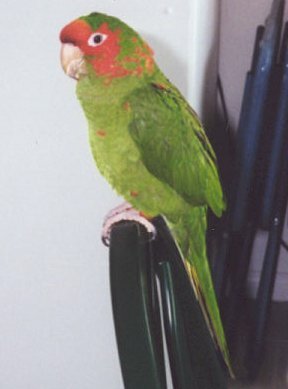 And of course there was the husband, who’d nicknamed the conure "Butthead." After spending a good hour probing with my questions, I decided to take him. The bird came free with cage, T stand, mirror, toy, bowl and seed. Had it not appeared so healthy I would not have taken it. I renamed the bird Fry. My influence for the name came from two sources: the movie Pitch Black and TV show Futurama. Both have characters by that name, the latter in which the character is a redhead. Aside from these sources, I’d never even heard of that name. "Fry" just had a certain ring to it that appealed to me. The first thing I learned about Fry was that he didn’t like hands, but other than that, was fairly tame. If you offered him a finger he’d scramble to get away; if you offered him your arm he’d hop right on. Despite being the largest bird I’ve ever owned, he’s also a strong flier (or jumper) when clipped. I placed his cage on top of my dresser which, unfortunately, had a built-in mirror. The cage was still to small but it was all I had at this point. I was currently living back in my old bedroom at my dad’s house, having just recently returned from Davis (late 1999), and was scheduled to move back out in June after my dad got remarried, when three additional people would be moving into the house. Because I knew I’d be moving, most likely to an apartment, I stuck with Fry’s old cage and didn’t spend too much time really working on him. Why bother getting him super tame and bonded if I couldn’t take him with me? 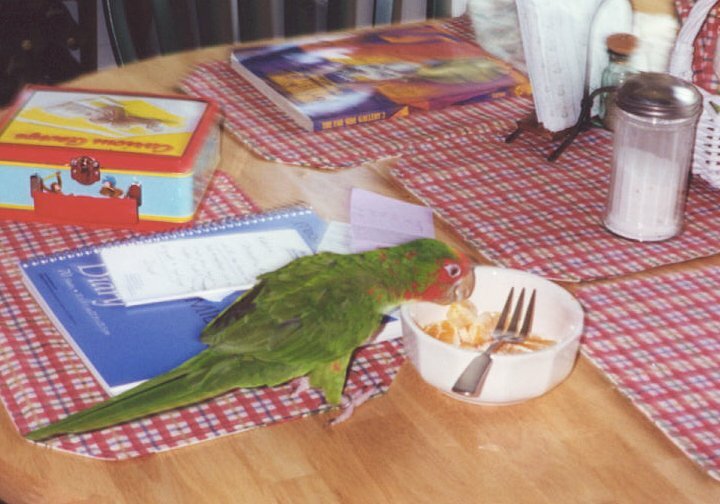 I was more worried about Jay-Jay, my sun conure, who was handfed and loveable. Jay-Jay also shared my room with Fry and helped me break his finicky eating habits. If I can get a bird that ate nothing but apple, white bread and safflower seed for six years to eat whatever I offer, YOU can get your birds on a healthy diet. Fry’s owner had "tried" to get him on a better diet but he refused to eat anything but the above listed items. I got him eating anything in two weeks. Jay-Jay’s cage was across the room from Fry’s. Every day I cooked up "breakfast" for the two of them after I got off work. Both dishes were the same style but varying colors. The good little girl that she is, Jay-Jay always dove right for the food. Fry wasn’t stupid. He knew that whatever Jay-Jay was eating in her bowl was most likely the exact same thing in his bowl. It not only seemed edible, but delicious. Jay-Jay could hardly contain herself when she saw the bowls coming. The second day after offering "breakfast" in this manner, Fry started picking at whatever was in the dish. I mostly fed Crazy Corn, birdie bread and veggies. Every few days or so I’d offer apples too. In addition to the Breakfast Dish method, I also expanded the Modeling method. Some time in the afternoon I’d make myself a meal, usually fried eggs and toast or slices fruit, and bring the birds into the kitchen to share it. Fry was nervous around me and the new room so I started out by placing him on the back of a chair across the table while Jay-Jay and I ate. After a few days Fry would jump onto the table and cautiously sneak some food before scurrying back. The toast tempted him more than anything. Jay-Jay always went for the egg yolk. I actually stayed at my father’s much longer than planned. I was originally scheduled to move out in July 2000, then in September 2000 (before school started) but did not get an apartment until February 2001. Fry went to live with my breeders. I placed him within a cage in Flight #1 along with plenty of toys. A few of my aviary birds started turning up with bitten toes; I had to place something on the top of the cage to prevent him from chewing anyone that landed there. Jay-Jay lived with me for a few months at my new apartment but unfortunately she just seemed too loud. After an incident with a college roommate I am very paranoid about bird noise. I couldn’t leave the room without Jay-Jay yelling for me and I couldn’t have her out all the time. She went to live in my aviaries as well. 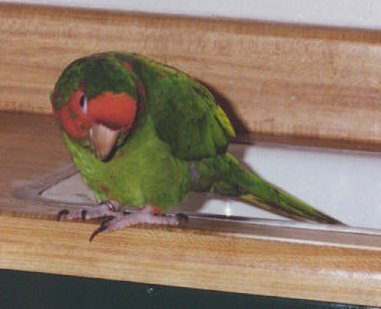 Unlike Fry, she got along well with all my birds. It is now February 2002 and Fry just moved into my apartment. Why the change of heart? I do have it written into my lease that I can have at least two birds. A third of the people living here seem to own birds though. I’ve seen budgies and tiels and heard finches. Someone even has a loud bird (amazon?). I went out and bought him a huge cage with plenty of toys. Hopefully I can really work with him this time. If he doesn’t get me evicted first.